"Mr. Valentine was a man of sterling qualities, and much respected and esteemed by those who had made his acquaintance." " in his early and lamented death photographic art has sustained a grievous loss." 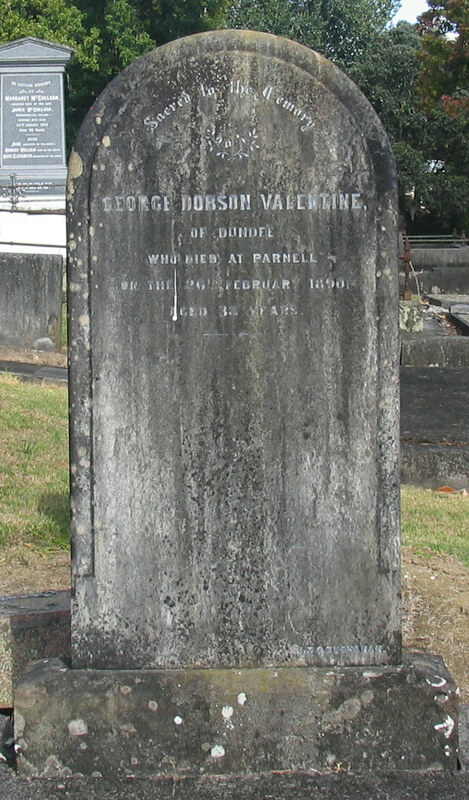 born 3 June 1852, Scotland , son of James Valentine and Rachel Dobson, died 26 February 1890 at his residence Cleveland Road, Parnell, Auckland, New Zealand aged 38 years, buried 28 February 1890, block C, row 3, plot 3, Purewa Cemetery, Orakei, Auckland. The Dundee Courier & Argus and Northern Warder (Dundee, Scotland), Friday, October 06, 1876; pg. 2; Issue 7240. 19th Century British Library Newspapers: Part II. photo by Gillian Ross, Find A Grave. The Dundee Courier & Argus (Dundee, Scotland), Saturday, April 07, 1883; Issue 9274. 19th Century British Library Newspapers: Part II. The Evening Telegraph (Dundee, Scotland), Saturday, April 07, 1883; pg. 4; Issue 1900. British Newspapers, Part IV: 1780-1950. 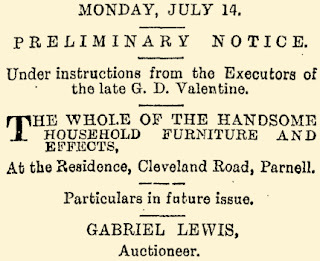 George Dobson Valentine and his family lived in Nelson from January 1884 until early 1885. A view of Nelson from Stanley's Crescent dated 2 December 1885 by the photographer William Edmond Brown. During their stay in Nelson the Valentine family lived at "Walmer House" . This house was previously leased by the music teacher, Mrs Macarthey who moved out at the end of January 1884 . 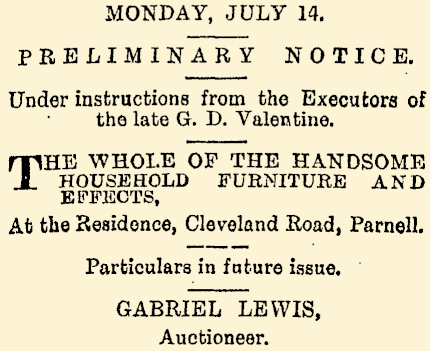 The house was advertised again for lease on 6 February 1884  and on three other occasions until 11 February 1884. George Valentine departed Nelson on 3 January 1885 on the s.s. Penguin for Auckland and arrived at the Port of Onehunga, Auckland at 12.30 on 6 January 1885 . He arrived back in Nelson on the s. s. Penguin on 28 January 1885. A slightly different view to photograph numbered 19 (above) showing a wider view with the cloud formation in a different position. This probably was taken with a different camera. The architect Robert Martin Watt was born in Scotland about 1860 and died at his residence "Glencairn" in Ponsonby on 14 April 1907 aged 47 years . 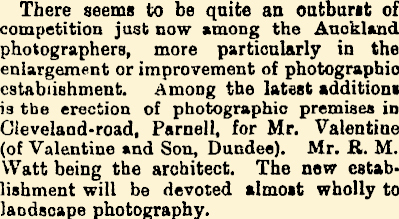 The second prize for landscape photography at the Wellington Exhibition (the only prize in this class which came to Auckland) was obtained by Mr. J. D. Valentine (of Valentine and Sons, Dundee), who is at present in Auckland, where he is about to take a series of views. He has already taken a large series of views of Lake Rotomahana and surrounding districts. 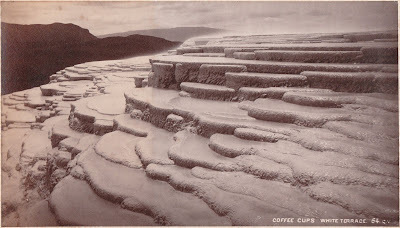 The photographic views are clear and sharp, and among those specially noticeable in these respects may be mentioned the view of Tarawera Lake - the White and Pink Terraces, the "Coffee Cups," the Umbrella Buttress," the cold water basins, and the cauldrons and geysers. They are an excellent illustration of the natural wonders of the Lake Country. Mr. G. Chapman, bookseller, Queen-street, is the sole agent for these photographs. Messrs. Valentine and Chapman, who left for the Lake Country on a photographing expedition, returned on Monday evening [Monday, 11 October 1886]. On reaching Rotorua, they took the Wairoa route for the scene of the volcanic eruption, finding on inquiry that it was the best for the purposes of their expedition. They slept at Humphries' hotel, Wairoa, which is quite habitable, and next morning were pulled over to Tarawera in Warbrick's new boat, which has been built to carry a party of eight tourists in addition to the crew. They were able to walk up the bed of the old Kaiwaka Creek with ease, the channel being better walking than the mud, even when hard. There are still a few places where the mud is heavy, and which are pointed out by the guides. The geysers in the basin of the Rotomahana Lake are now quiescent, so that tourists can make round to nearly the site of the Pink Terrace. One of the finest views is to be got from the hill behind where the White Terrace stood, overlooking Rotomahana, and the right of Tarawera, as a view is got of the valley up the Maungakakaramea. Messrs. Valentine and Chapman got one photographic view, which, when compared with the outlines of the hills as taken previously to the eruption, proved tolerably conclusively that a lake now exists on the site of the White Terrace. The general opinion of those who have visited the locality recently, and were well acquainted with it previously, is that the Pink Terrace still exists, though buried under mud. After trying both the Wairoa and Pareheru routes, Messrs Valentine and Chapman give the preference to the former, as being the easiest of the two, and giving the tourists the best view of the rift at Tarawera, and of the scene of volcanic eruption in the bed of Rotomahana Lake. They succeeded in getting a good series of photographs of all the principal features of interest. Between Rotomakariri and the site of the White Terrace a number of small lakelets have been formed, of various colours — light and dark blue, light green, mauve, black, and pure white. During their stay at Tarawera they saw four jets of smoke thrown up from the Tarawera craters. No provision has yet been made at Pareheru for the accommodation of tourists, and it is still necessary to ride back to Rotorua the name day, making a journey in all of 34 miles, which leaves little time in the one day to inspect the "lions" of the New Wonderland. We have to hand a series of Christmas and New Year cards, from Mr. G. T. Chapman, stationer. They comprise over 40 different varieties. The designs were sketched by a celebrated English artist recently on a visit to New Zealand. There are ten of the Tarawera eruption, three of Maori domestic life, eight of bush scenes, five of Auckland city and neighbourhood, and remainder miscellaneous. The cards show a Maori village with large wharepuni, and group in foreground. By a quaint coincidence the space occupied by the window in the whare is filled with local photographs by Mr. Valentine, photographer then there is a study of some splendid specimens of the punga or tree fern; a group of cabbage trees, of the nikau palm, and of Lake scenes. In the blank spaces, in addition to views of local scenery, there are placed views of Rotomahana and the eruption, recently taken by Mr. Valentine, thus adding greatly to the artistic effect of the cards. These souvenirs of the approaching festive season are likely to become very popular, and are being disposed of at moderate rates, as will be seen by reference to our advertising columns. 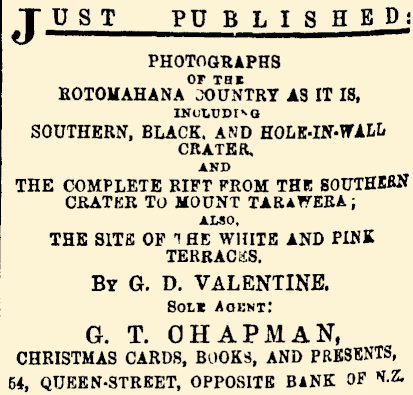 Perhaps the finest set of photographic views which has yet been obtained of the line of volcanic craters, and of the great eruption of Tarawera, has just been secured by Mr. Valentine, photographer of this city during his recent trip to the Lake Country, and from which he returned last week. As showing the care manifested to obtain the views under the best atmospheric conditions only seven have been obtained in the whole fortnight, but these form a complete panoramic view along the whole line of volcanic action from the southern crater to the top of Tarawera mountain. We understand they will be used in illustration of the valuable and interesting work on the Tarawera eruption shortly to be issued by Mr. Percy Smith the Assistant Surveyor-General, in connection with his department, Mr. Smith being greatly pleased with them. Mr. Valentine states that the craters are changing greatly both through volcanic action and landslips, and in the four days he wandered among them several material alterations occurred. He happened to be at the Rotomahana basin the other day, when the brown smoke arose from the top of Tarawera, which gave rise to the rumour of a fresh eruption, but he states there was nothing in it, the condition of the atmosphere simply presenting the ordinary steaming appearances in a new form. 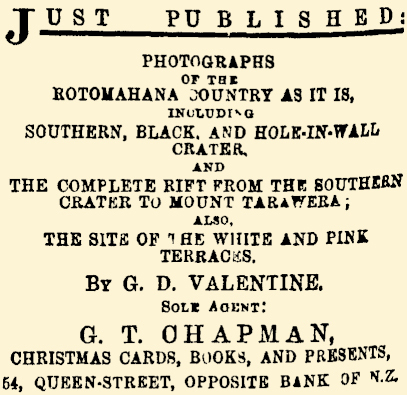 On the arrival of Mr. Valentine, the celebrated photographer, at Rotorua, arrangements were promptly made by Mr. Blythe, Government Engineer, to enable him to accompany his survey staff, which was just starting on an expedition to the volcanic centre at Rotomahana for the purpose of making observations and taking notes of any alteration or change that might have occurred since Mr. Percy Smith's last visit, and reporting such to the Government. Your own special was fortunately invited to join the party, and he now writes the result, confining himself entirely to facts and setting aside the flowery language and imaginative ideas usually expressed in the embellishment of such descriptions. Two packhorses and men thoroughly equipped proceeded, shortly followed by Mr. Valentine and Mr. and Mrs. Blythe on horseback. (I may here note that this was a very plucky venture for a lady to make, one which required a considerable amount of endurance but Mrs. Blythe proved equal to the task and kept pace with the best of us). The overland route following Mr. McIntosh's line of road was taken, which we found to be in excellent repair. After crossing the Waipa stream and about three miles ahead, the road diverged into the new Government line to Galatea, recently surveyed by Mr. Blythe, and at present under construction, following which, at easy grades, a fertile valley is reached, leading up to the native village of Pakaraka, prettily situated on a rising bushy hill. This place is now the adopted home of the Ngatitu a tribe driven from their old settlement at Kaiteriria, by the recent eruption. Traversing along a number of easy but uninteresting gulleys for over three miles and a-half, Pareheru is reached, and it is from here that the first view of though vast and desolate panorama of volcano destruction is obtained. Passing this to the left, the curious and wonderful mountain of Maungakakaramea crops up, at the foot of which and at the head of the Waiotapu Valley, lies the survey camp, our destination for the night and headquarters for the future. We have travelled all this distance (about twenty-five miles) just on the fringe of the volcanic deposit, the journey having been accomplished at a walking pace in five hours. The camp consisted of five tents, comfortably fitted up with beds. Just in front a purling little brook of the clearest water came rippling past, alongside of which ran another of a milky muddy colour (the outlet of Lake Ngahuia), the two streams blending a short distance below, and therefore spoiling the water. The Government road line to Galatea passes through here and close under Maungakakaramea. This place, to my fancy, will before long prove to be a most attractive spot, being a central and convenient station for making detours to though various surrounding wonders. Next morning opened out hot and sultry. Most of this day was spent in leisurely exploring within a radius of five miles down the Waiotapu Valley. The view down this is very extensive, and numerous jets of steam are to be seen issuing from some of though most lovely tinted springs, and some of the most abominable mud fumaroles in existence; though natives say there are over 150 of them, and but few have been either visited or christened. Far away in the distance, and across the River Waikato, is to be seen the great Ohaki geyser, never silent, but always belching up great volumes of steam and water. To the right of this stands in solitude supreme the lofty mountain of Tauhara. The first solfatara we came across - which, for lack of a name, we christened No. 1 - was a large circular basin, with irregular sides of bright-coloured clays, at the bottom of which, from a number of minor basins, spouts up steam and water in various shades and degrees in boiling. This is a pretty sight; but, in viewing and walking around it, great care is necessary in footing it, as the ground is exceedingly treacherous and hot underneath break through the crust, and the chances are a scalded foot. A little further on brings you to a most repulsive-looking abyss, which Mr. Valentine christened the "Porridge Pots". Basins, cones, and fumaroles of black, boiling mud spluttered here in all directions, several others of a similar nature were passed. There exists a paraffin spring somewhere in this locality, which substance can be scooped off its surface with a spoon, but we did not see it. Turning in a homeward direction we suddenly emerged on a dark coloured pool, part of which was covered with a dirty, soapy looking froth, quite still, but apparently boiling underneath, as the following painful incident will show One of our faithful followers, a young retriever mastiff named Pepper, in its eagerness to reach the water, and mistaking the surface for solid ground, bolted in, and with a yelp disappeared-head downwards. A few struggles and all was over, leaving only a round hole as if broken through ice to mark the spot. The poor brute could not have suffered much pain, as its head never came up death must have been instantaneous. Better this than if rescued in a parboiled state. We turned our backs upon the scene with feelings of horror and disgust, and for the rest of the day our ardent spirits were completely damped. We christened that pool "Pepper," after the dog. It might have been the kerosene spring for all we knew we did not dwell long enough to find out. Languidly retracing our steps, a strong sensation of drowsiness overcame us, doubtless caused by the abominable surrounding gaseous vapours, which made us push on, and scrambling through tall tea-tree, breaks, and tangled scrub, we arrived at our camp, thoroughly exhausted. After a little rest, we made for Mount Kakaramea, which stood towering up right in front of us. At its base, snugly lies a most lovely lakelet of an opalistic hue, beautifully set in a growth of luxuriant, almost tropical-looking scrub. Within a stone's throw of this is Lake Rotowherowhero a misnomer, I should fancy, "whero" signifying red in Maori, and the waters of this lake are of a decided greenstone colour, entitling it to the appellation of Rotopounamu — at least to my idea. However, it is a perfect gem of great beauty, teeming with wild duck and teal, as tame as barn fowls. Several other lakelets and pools of various colours are to be seen in this locality, but we had seen enough, and so passed day No. 2. Next morning was bright and sunny. Skirting Lake Ngahuia to the right, and getting to the crest of the last fern-covered hills at the northern base of Maungakakaramea, we touched upon the mud deposit which extended as far as the eye could reach. This coating is firm and hard, the innumerable ridges being furrowed as if ploughed, but in the valleys the mud is soft and treacherous, at least in some places, which quickly brings one to kneedrill, and renders a certain amount of caution necessary, especially after rain. Rounding the eastern end of Lake Okaro, once a pretty sheet of water, fringed with trees and rich vegetation, but now a veritable quagmire, we steered in almost a bee-line to the southern crater. At a point near here, which is virtually the extreme south end of the great rent, the finest and most comprehensive view of the whole eruption is to be obtained, as you look through the complete line of fissure, extending over Rotomahana and right up to the summit of Ruawahia. The activity in the southern craters, Black Crater, and Echo Lake, has almost subsided. There is water at the bottom of them all, but only in spots in a state of ebullition. Immense avalanches of mud appear to be constantly falling in, and the spot you stand on to-day is probably gone to-morrow. A view was taken by Mr. Blythe, of Boulderfield, just in front of the "Hole in the Wall." These immense stones, some of which are from one to ten tons' weight, are very irregular and of many colours and composition. On Friday morning we were early astir, being roused from our well-earned sleep at four a.m. by the call of "breakfast ready." At half-past six a.m. we were all equipped and a start was made. The weather was all that could be desired, and we jogged briskly on, pursuing the same course we had taken on the previous day. Arriving at the extreme southern end of the rent at twentyfive minutes to eight a.m., a glorious sight presented itself. The sun had just risen over the hills, casting a grand light and shade along the whole line of rent towards Ruawahia, sufficient to make the heart of an artist rejoice. After a rough and tumble sort of a walk up hill and down dale, we came upon the Black crater, on getting up to the lips of which, we passed over an extraordinary slope of jumbled up mud, just as if a rough sea had become suddenly petrified. Over this the walking was both disagreeable and fatiguing however, we were amply repaid on reaching the top, which we did at forty-five minutes past nine a.m. The view obtained from here was simply magnificent. The bottom of this crater is a most abominable-looking abyss, filled with coffee coloured water, and boiling in places. It is a hazardous venture to peer over the edge, and I should not advise anyone to do so, as the sides are constantly falling in. We then wandered in the direction of the Rotomahana craters. Coming to the foot of Hape o Toroa we clambered up the crater end of this hill, resting half way by digging our heels into the mud and turning round on our backs, not far short of a perpendicular position. But there was still a more sensational exploit in front of me, as I found we had to make an almost perpendicular descent on the northern side. I eventually succeeded in reaching the bottom in a high state of nervous perspiration. There we were on a comparatively level plateau, overlooking the spot on which the lovely Pink Terrace once stood. Most of the ngawhas and fumaroles were quiescent - many quite extinct. Natives had arrived by this time with horses to assist as in getting back, Mr. Blythe thought it advisable (in order to be at Te Ariki by sunrise) to camp for the night at Pareheru, which we did, Mrs. Blythe returning to our old quarters at Maungakakaramea. Pareheru camp is situated on a fern-clad hill, close to the bush, and on the borders of the mud deposit. A splendid view of the whole arena lies at one's feet, and it appears to me that before long this will become an important station, if not the head centre for tourists visiting Wonderland. A spur or a gully runs down from here leading to almost any crater in the field, which can be followed on horseback, an immense advantage. We found a Maori here named Penetito, who is preparing to start an hostelry on this spot and provide horses as well. Next morning, on looking around, every indication of a nor'-easter appeared, so our meditated visit to Te Ariki had to be abandoned, and we hastened as quickly as we could back to our old camp at Kakaramea. Next day, Sunday, was spent pleasantly in camp, and we rested from all our labour. Monday morning looked more promising, but a good deal of rain had fallen, so we thought it advisable to give the mud time to dry and harden, and leave Te Ariki alone for a day or two. Wednesday morning was beautifully fine, and after another four o'clock breakfast, we managed to get away from the camp a little before five a.m. This was to be our Te Ariki trip. Pursuing our old course, past the southern end of the rent, we kept well to the left, getting into a leading gorge running towards Pareheru. At the bottom of this an immense deep rut, averaging 3 feet across, with upright sides of solid mud 30 feet high, traversed the gorge. Following up this weird-looking defile we found it gently led us over the leading spur to Hape-o-Toroa. Keeping the Black Terrace Crater to our right, and passing over some hot and dangerous ground, emitting the most abominable gaseous vapours, we reached Te Ariki at twenty minutes past nine am. There was very little steam rising to obstruct the vision, and everything could be seen so clearly. A placid little bluish green lake lay at the bottom, a miniature mountain of black rugged rocks steaming all over lay at the extreme southwest end, which we christened the "Fumarole Peaks" (an awful feature in the abyss), and away round on the opposite side rose a high mound of burnt-looking clay, near the base of which jets of steam shot out horizontally, and all on a regular level, in appearance as if a salute was being fired from the lower ramparts of a bombarded castle. Another place showed an immense volume of steam ascending from a furiously boiling lakelet. This we determined was originally the site of the once glorious White Terrace but oh, what a transformation! Neither time nor space will permit of going into the many changes that have occurred, or the wondrous sights now made visible and laid bare at the bottom of this great and awful crater. So we hasten back. Retracing our steps we pause at the lips of the Black Terrace Crater. This one was the last in action, and had just burst out as Mr. Smith left the field on his last visit. The proper name of this, as it is laid down in Hochstetter's chart, is "Te Ngawha Atetuhi," then only a little boiling spring, but now several acres in extent. The Black Terrace Crater is quite a misnomer, as there is nothing black about it, or any signs of a terrace formation whatever. The upheaval here must have been very great. Numerous boulders and stones of all colours and descriptions lie scattered about in all directions. We picked up some fine specimens here, amongst which were lumps of petrified wood and charcoal. Next morning was a general pack-up, and we started homewards on our journey back to Rotorua the same way as we came, each one feeling delighted with the success attending and the pleasure afforded by a never-to-be-forgotten meander in Wonderland. I may mention before closing this paper, as a guide to intending tourists, that our party, in their opinion, gave the preference of the routes to the one we had taken, viz., via Pareheru, for two reasons. Everything worth seeing can be visited in one day, and one can ride all over the field on horseback, scarcely having occasion to leave the saddle during the entire day. But a more agreeable way of doing it, if time and money will permit, would be to go by Pareheru, send the horses back, and return by boat to Wairoa, or vice versa. 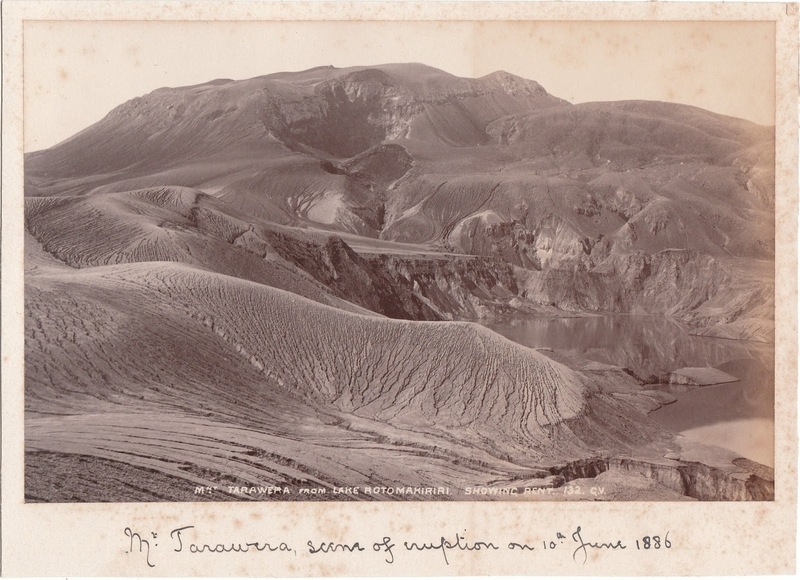 The curator of the Otago Museum has received from Mr G. Fenwick a series of views of the Tarawera eruption. These were presented to Mr Fenwick by Mr G. D. Valentine, photographer, Auckland, and were considered to be so excellent a series as to be worthy of a place in the museum in connection with the very complete collection of volcanic specimens some time since forwarded to the museum through the instrumentality of Mr G. M. Main, of Auckland. 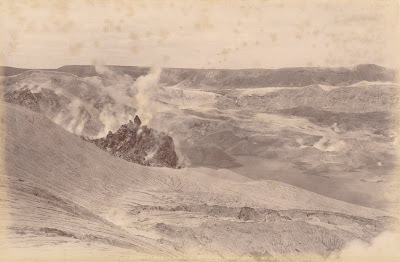 The photographs are the result of a visit made to the scene of the eruption by Mr Valentine. Nos. 23 and 129 show the White and Pink Terraces as they formerly existed; 41 and 119 Tikitapu Bush before and after eruption; 121 and 125 give a good general idea of the destruction caused by the eruption; 127 and 37 show the devastation at Wairoa boat landing, Lake Tarawera, also alteration of outline of top of mountain Tarawera; 15 and 135 solve the question beyond doubt of the total destruction of the White Terrace - No. 15 being taken from nearly the same point before, and 135 after eruption, by superimposing 15 on 135 and holding them up to the light, getting the distant hills in each into line, the exact position of site of White Terrace is ascertained; 129 shows present boat landing at Te Ariki, which is over 150yds of made ground into Lake Tarawera, formerly 300ft deep at that point, showing the immense body of deposit; 440 [144?] and 147 show active fumarole peaks at White Terrace end of Rotomahana. 133 gives a view of numerous fumaroles occupying supposed site of Pink Terrace. The Pink Terrace having never been located by the Survey department or otherwise, it is impossible to say whether it has been blown away or is simply covered up. In either case there is an absolute certainty of its having been destroyed; 142, 140, 138, and 131 form a complete series of the great rift Rotomahana, the nature of the ground rendering it impossible to secure a panoramic view of a fissure estimated at seven miles in length, and shown in these series of views from end to end. The Assistant Surveyor-general, Mr Percy Smith, is so well pleased with the rift set, that they will appear in his new work, now in preparation, on the Tarawera eruption, and to be published under the auspices of the Survey department. The photographs are now being framed, and will be hung in a conspicuous position in the museum in the course of a day or two. Among the passengers by the steamer Richmond yesterday, for the Islands, was Mr. Valentine, the well-known photographer, who goes the round trip on a photographic tour, on somewhat similar lines to that initiated by Burton Brothers, of Dunedin, photographers — "The Coral Islands through the Camera" — during the annual Islands' excursion inaugurated by the Union Company. Mr, Valentine will visit Tonga, Rarotonga, Samoa, and Tahiti, and other islands, for the purpose of taking the principal points of interest on the coastline and inland. He intends also illustrating by a series of photographic views, the fruit industries of the Islands and the sugar industry, etc. It has been arranged to pass close to the volcanic island recently thrown up off Tonga, for the purpose of enabling Mr. Valentine to get a good photograph of it. Mr Valentine, photographer, has gone on a tour of the South Sea Islands to take views, etc. Recently Mr. J. D. Valentine (sic), the wellknown photographer, made a tour of the islands in the steamer Richmond. 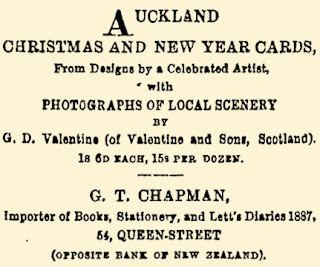 It will be seen from our advertising columns that the photographic views are now ready for sale at Mr. G. Chapman's, bookseller, Queen-street. They comprise a series of some twenty-five, embracing the islands of Tonga, Rarotonga, Samoa, and Tahiti. 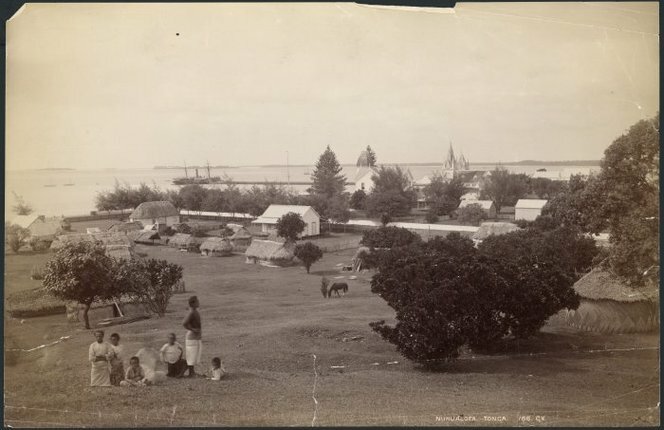 View of Nuku'alofa, Tonga - Photograph taken by George Valentine. Union Steam Ship Company :Original prints of Samoa, Rarotonga, Tonga and Tahiti. Ref: PAColl-5426-40. Alexander Turnbull Library, Wellington, New Zealand. http://natlib.govt.nz/records/22699901. Among them is a view of Nukualofa (Tonga), showing harbour and coral islands in the distance. In the foreground is a native village, and in the middle distance King George's Palace and private chapel. 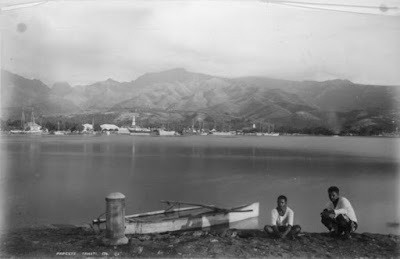 There are five views of Apia (Samoa), one from the sea, a second from Matafele, and a third from Motoutu. Among the landmarks in the latter are McArthur and Co.'s premises, the American Consulate, and the Roman Catholic Cathedral, with its lofty spire, built of coral. A fourth view gives a sketch of Samoan scenery, group of native women washing clothes in native fashion by beating on a stone, and of native outrigger canoes. A view is given of Morea, an island off Tahiti, having a most fantastic outline, and which has been apparently the scene of great volcanic activity. There are several capital views of Papeete, the capital of Tahiti. 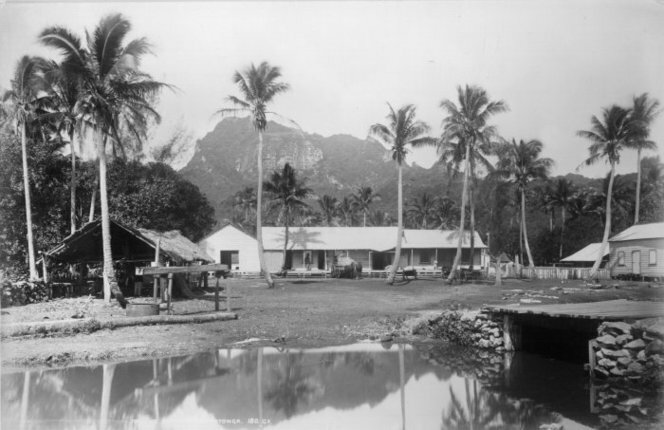 One is taken from the reef at the entrance of the harbour, showing the French warship Duquene and other vessels of the French South Pacific squadron in port, as also numerous merchant vessels, and the town well nigh embowered in foliage, with its grand background, the Fataua ranges. A second view shows an extraordinary formation of hills, resembling those of Tarawera after the eruption, and giving the impression that they have been formed in a similar manner. The wharf Papeete, Tahiti. 158. G.V. The third view gives a graphic picture of the boat harbour, where at early morn come boats from the various islands laden with produce for Papeete market, and in the distance is to be seen the Roman Catholic Cathedral. A fourth view is from the ranges, showing the township and port from that point, the former scarcely visible, owing to the extensive use of shade trees on the thoroughfares. 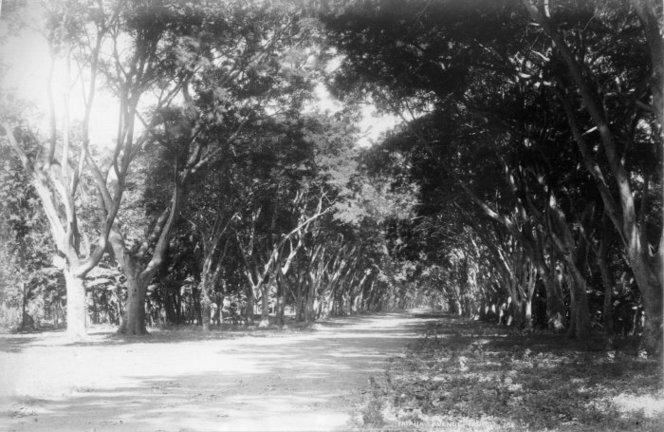 A sketch of Fataua gives an excellent idea of the general appearance of the shade trees, forming grand avenues for miles in length in the capital, and extending for 40 miles throughout the island. Another view illustrates the orange-growing industry — the long sheds where they are packed in boxes and transported in double canoes to the Richmond. 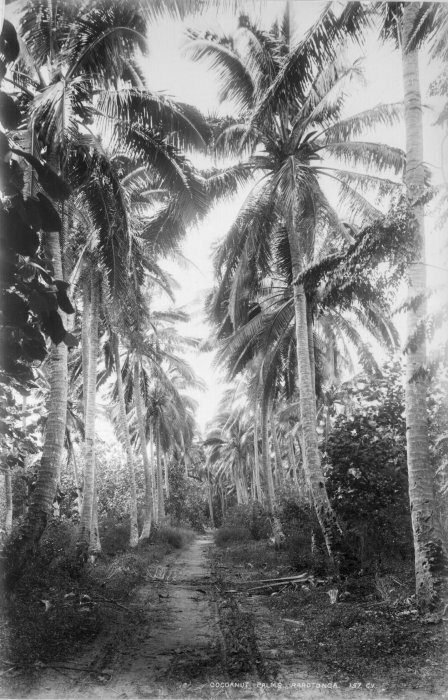 There are seven views of Rarotonga, showing its tropical vegetation, the gem being an avenue of cocoanut palms. The object Mr. Valentine had in view in getting this photographic series was to illustrate the scenery and industries of the islands. He was so enamoured with Tahiti and its beautiful scenery that he contemplates returning next season to complete his series, which limited time prevented his accomplishing on the present trip. The photographs are executed with the taste and artistic finish which characterises Mr Valentine's work. Those relating to Samoa and Tonga are especially interesting in view of recent events, while the whole series embrace ground unfamiliar to the Auckland public, and therefore possessing the charm of novelty and freshness. In view of the approaching departure of two members of the staff of Messrs. Arch. Clark and Sons, warehousemen, from Auckland — namely, Messrs. G. Brown, and A. P. Hillyer — their fellow employees have presented each of them with a large and handsome album of Valentine's photographs. In the frontispiece of each album is an illuminated inscription, as follows "A souvenir from old friends at Arch. Clark and Sons, Auckland (N.Z. ), July, 1887." In addition to the inscription is a pretty sketch of Auckland harbour scenery. These have been executed by Mr. James Slator. The one recipient goes to England, the other to Sydney. "One curious feature of the Tohuringa mud volcano is that the liquid mud comes up in bubbles — an exact representation of the arum lily in shape — before bursting into the air. There is, on the way down the valley, after passing it, a beautiful miniature terrace of the shape of a fan coming out of the side of a bank of grey clay. Passing from there, the tourist goes over an enormous area of ground containing large pits, the walls of which are a perfect artists' or colourman's show board, every conceivable colour — dark red, purples, and all shades of yellow. A remarkable feature is the sulphur caves in the sides of these pits, the fumes forming stalaotites of sulphur, pendent from the mouth of the cave. These features are so delicate that at the slightest touch of the finger they crumble into dust. If these wonders of Nature are not protected by Government appointing a curator, the vandalism of tourists will soon make them a thing of the past. As these natural beauties are all on Crown land the matter of their protection ought to be seen to. Tho cauldron at Kotere-Kairamua is about an acre and a half in extent, and is fall of boiling strongly acidulated water, the margin having beautifully scalloped edges. At one side of the terrace is a sulphurous spring, which from this point turns the whole of the overflow, and passing along a narrow race falls over a cliff of about 13 feet in height. The deposit forming on this is sulphur crystals, and gives a fall having the appearance of solid sulphur, and of exactly same formation as the staircase of the Pink Terrace. Standing at the foot of this fall, and looking to the left, one feels as if transported from a Valley of Horrors to Fairyland. Large cliffs of pure alum stand out in perspective like the side wings of a theatrical stage against a background of dark-red earth, in the centre of which are several of these sulphur caves, giving an exceeding variety of beauty and colour." Recently Mr. G. D. Valentine, the wellknown photographer, made a photographic tour of the Lake Country and Taupo, and has returned to town. The whole series comprises Whakarewarewa, Tikitere, Waiotapu Valley, Waiarakei, and Taupo. The six views of the principal scenes of Waiotapu commence with a view of Maungakakaramea, Sentinel Rock Crater, at the foot of same famous mountain, and Tohuringa, a large mud volcano — in fact the largest mud volcano in the whole of the Lake district — measuring 18 feet in height, and 30 feet from lip to lip. Next is a terrace, the colour of which is a most delicate primrose. Its sole beauty being the delicate primrose colour, its reproduction by photography was an impossibility. Next comes Kotere-Kairamua — the new terrace formation, — although wanting in many of the striking features of the Rotomahana terraces, it may best be described as a reproduction of the trickling buttresses of the White Terraces. Another picture is the Sulphur Caves. Of Waiarakei there have been obtained the four principal sights of the Waiarakei Valley the great Waiarakei Geyser, Champagne Pool, Eagle's Nest, and the Twin Geysers. Some remarkable effects hare been secured by the use of the instantaneous drop shutter. By the new road which forms part of the proposed new route from Rotorua via Waiotapu Valley, Orakei-Korako to Waiarakei and Taupo is got a view of the Huka Falls and a large tract of the valley of the Waikato. On the opposite side of the Waikato is got a view of the Spa — Joshua's Glen. Ten minutes' walk from the Glen is the far-famed Crow's Nest geyser, which Mr Valentine was fortunate in getting in action, and securing a drop shutter photograph of this remarkable geyser, which at the time of his visit was shooting into the air to a height of 60 feet. The Waiotapu series of photographs are the first given to the public of that famous valley, and will be, from their novelty and beauty, especially prized by tourists and lovers of nature. The well-known photographer, Mr. G. Valentine, has recently made a trip to Rotorua and the Okoroire sanatorium, with a view of photographing various points interest with which tourists are not so familiar. The Okoroire views are three in number — first showing the Waihou river as it debouches from the waterfall with the bathing establishment and sanatorium; second, the natural bridge which forms one of the wonders of the sanatorium, and third, the Waihou above the falls. These will be quite new to the Auckland public. Of the Rotorua views there are four - one of "Sodom and Gomorrah" from the heights; second, of the Spout Pool as enlarged; third, the Paihutu Geyser, 70 feet high, with three distinct jets, known as "the four o'clock geyser" by tourists owing to its generally playing up at that hour. This is an especially fine photograph, showing the geyser, to advantage. A photograph of the site of the sunken pa at Ohinemutu point, illustrates very forcibly the lowered level at which Lake Rotorua now stands. 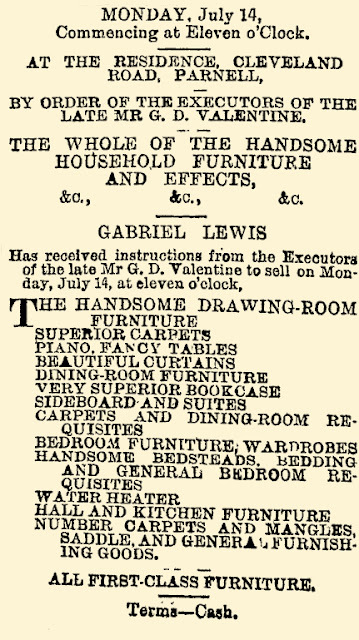 Mr. Valentine has also taken views of the new Customhouse building in Customs-street West, and of the Grand Hotel, Princes-street, which bring out very well in relief the various details of their style of architecture. The whole series are now on view at the premises of Mr. G. T. Chapman, bookseller. Mr G. D. Valentine, the well-known photographer, died yesterday afternoon, after an illness extending over several weeks, leaving a widow and a young family. Mr Valentine had not been many years in the colony. He was late of the firm of Valentine and Sons, of Dundee, and came out to Nelson a few years ago for his health. For some time past he had resided in Parnell. He was an enthusiastic photographer and devoted to his art. A few years ago he made an extended Island trip to Tonga, Samoa, Tahiti and Rarotonga and secured many splendid views. His photographs of the lost Rotomahana terraces, the Waitomo Caves, and other New Zealand views, were some of the best of their kind. Mr Valentine had a large circle of friends and was very much esteemed. It will be seen from our obituary column that Mr. G. D Valentine, the well-known photographer, has passed away. The deceased was late of the firm of Valentine and Sons, Dundee, Scotland, and some years ago he came out to Nelson for his health. After staying there a couple of years he came on to Auckland with his wife and family, and settled in Parnell where he built a residence. He was enthusiastic in the practice of his profession, and went the first trip of the s.s. Richmond to the South Seas, making a photographic tour of Tonga, Rarotonga, Samoa, and Tahiti. His views of the Rotomahana terraces, the Waitomo caves, etc., are among the finest of their kind. Lately Mr. Valentine paid a visit to Rotorua, and it is supposed overexerted himself in his delicate state of health. He gradually got worse, and although Dr. Mackellar did all that medical skill could accomplish for the patient, he passed away yesterday afternoon. Mr. Valentine was a man of sterling qualities, and much respected and esteemed by those who had made his acquaintance. He leaves a widow and a young family to mourn their loss. The Society of Arts Exhibition ... Mr. Valentine (per Mr. Chapman) new set of views of Lake scenery. We were shown to-day by Mr Tyree three frames of photographs which are being dispatched to-day to the Exhibition at Wellington, where they should make a good show. One of them contains some beautiful views of the Hot Lakes and neighbourhood taken by Mr Valentine, and the other two are Mr Tyree's, one of them consisting of portraits and the other of views of Nelson scenery. An inner room contains a collection of photographs, so lifelike and so exquisitely finished that the visitor will find it hard to tear himself away from them. Here, too, is Nelson honorably represented by a case of photos, the work of Mr G. D. Valentine, all of which are masterpieces, that of the nikau palms near Takaka being in my opinion one of the choicest gems in the whole collection. 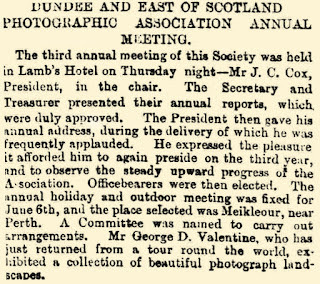 The second prize for landscape photography at the Wellington Exhibition (the only prize in this class which came to Auckland) was obtained by Mr. J. D. Valentine (of Valentine and Sons, Dundee), who is at present in Auckland, where he is about to take a series of views. He has already taken a large series of views of Lake Rotomahana and surrounding districts. 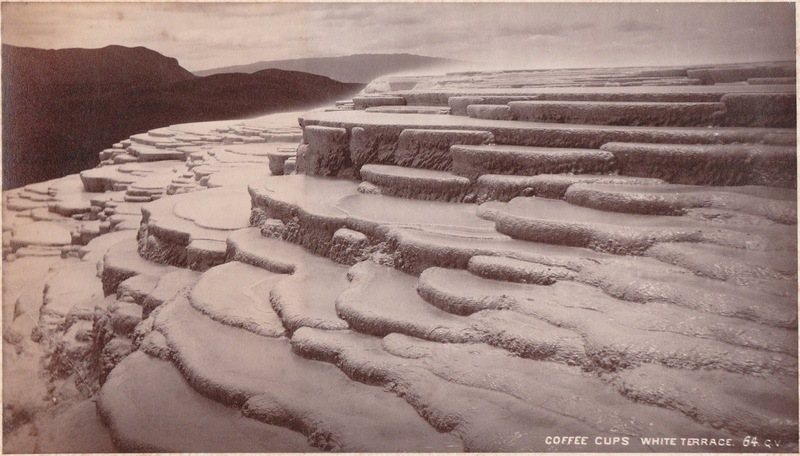 The photographic views are clear and sharp, and among those specially noticeable in these respects may be mentioned the view of Tarawera Lake - the White and Pink Terraces, the Coffee Cups,"the Umbrelia Buttress," the cold water basins, and the cauldrons and geysers. They are an excellent illustration of the natural wonders of the Lake Country. 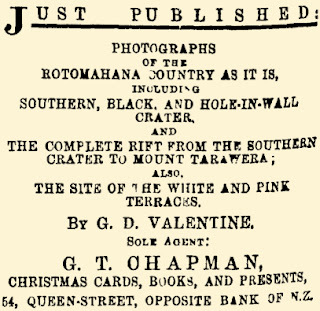 Mr. G. Chapman, bookseller, Queen-street, is the sole agent for these photographs. The following is a brief notice of photographs at present on view at the Auckland Photographic Club's Exhibition. 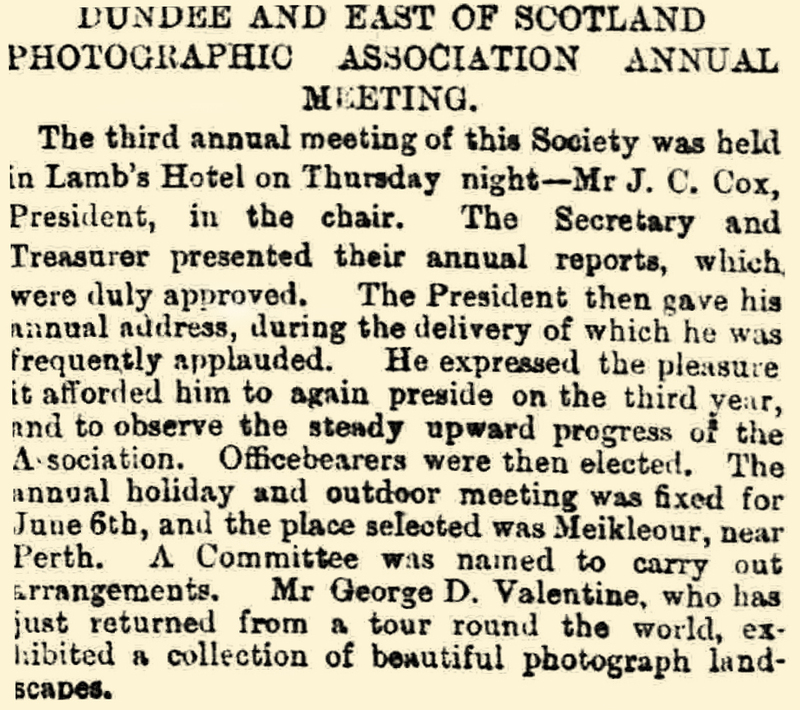 The first place among the exhibits is deservedly taken by a series of ten photographs, the work of the late G. D. Valentine, first president of the Club. ... There is a splendid collection of views by the late Mr. G. D. Valentine, photographer, on exhibition. 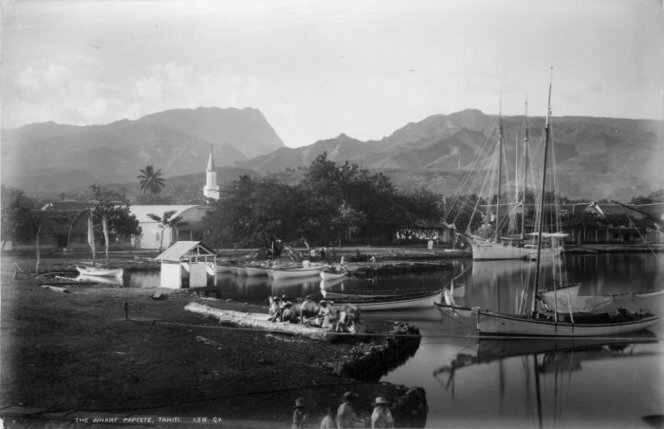 They comprised views of the Lake Country, Samoa, Rarotonga, and Tahiti. For excellence of workmanship, clearness of outline, and artistic treatment they fully sustain the high reputation he had earned in this city as a photographer, and make one feel that in his early and lamented death photographic art has sustained a grievous loss. Mrs Valentine and two children. George D. Valentine - A 19th Century Photographer in New Zealand, Ken Hall. "Scotland, Births and Baptisms, 1564-1950," index, FamilySearch (https://familysearch.org/ark:/61903/1:1:XYR6-CBX : accessed 5 June 2015), William Smith in entry for Williamina Arnot Stirling Smith, 03 Mar 1856; citing DUNDEE,ANGUS,SCOTLAND, reference ; FHL microfilm 6,035,516. Port of Onehunga, Arrivals - Auckland Star, Volume XXVI, Issue 5451, 6 January 1885, Page 2.